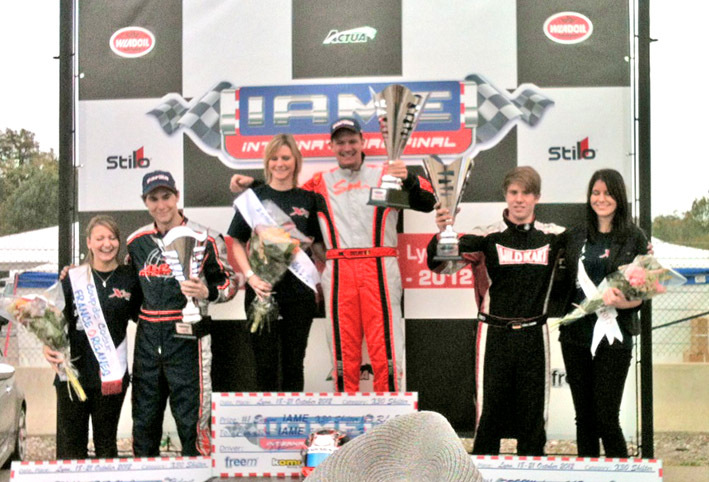 The big IAME X30 International Final was held from 18th to 21st October 2012 by perfect weather conditions. 173 drivers from more than 15 nations met at the modern Actua Kart Circuit in Lyon (France), fighting over who's worlds best IAME pilot in 4 different classes. Certainly involved: the Halder siblings from Team WILDKART Germany. Michelle Halder started in the Junior class, her brother Mike mingled on the Shifter class. Additionally Christian Hillenbrand wanted to show, what's possible with a WILDKART chassis in the Senior class. But from the beginning he had problems with his two engines, in the practice he fell back at a hopeless position. In free practice on Thursday, it was first to learn about the more than 1 kilometer challenging circuit. To make matters worse, that on the siblings Halder completely unknown circuit, new KOMET tires were prescribed. Also new was the actual driving experience at an extremely high international standard with a much tougher competition than the national level. But the qualifying on Friday showed that Michelle and Mike Halder could perfectly keep up with the international competition. Michelle finished on a solid 11th place in the Junior class with a 50,776 and thus only 0,338 seconds behind the first. Her brother Mike struggled with a 48,115 the 2nd place in the Shifter class. He was just 16 hundredths behind the leader. In the Heats on Saturday Michelle Halder couldn't improve her time and slipped unfortunately to 15th place. After failure her brother Mike only reached 7th place. Christian Hillenbrand couldn't improve in the heats because of his engine problems, so he doesn't participate in the B-Prefinals. For Michelle Halder the Prefinals on Sunday began very unlucky. Shortly after the start, she was pushed out of the track. She made it back to the track, but the field was already far away, so the race directory prevented her comeback in the race. At Mike Halder everything went according to plan. With an outstanding performance he could reached start position 6. In the really high class final, Michelle Halder always gave it her all. After 18 long laps she gets a well-deserved and hard-fought 11th place, just a blink of 1,5 tenths after her countrywoman Vivienne Dingert. This result is worth all the honors in view of the 29 starters from 11 countries. In the Shifter final, Mike Halder showed there are no different from anybody else. With an excellent performance the WILDKART pilot catapulted himself in a tough fight on the 3rd podium place. So he was the only german driver on the podium in all classes. With 2,232 seconds behind the winner Thierry Delre from Belgium and just a tenth second Sekunde behind the second-placed Mathieu Klinger from France, Mike Halder went absolutely at the top of the world-class. This result at an international race is not only good, it's outstanding. WILDKART Italy congratulates Michelle and Mike Halder for their exceptional performance in this international race thanks as well to WK Germany for supporting them .